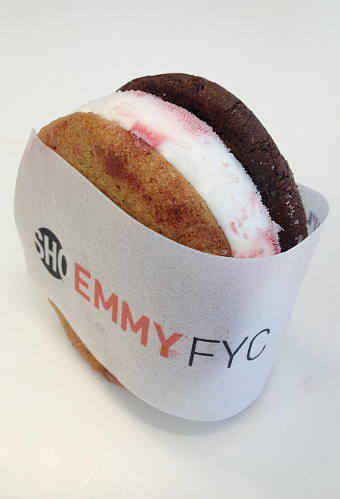 via press release: SHOWTIME® TO OFFER FREE Dexter® COOLHAUS ICE CREAM SANDWICHES THIS WEEK AS PART OF ITS FYC Emmy® CAMPAIGN. LOS ANGELES – June 18, 2013 – To mark the launch of the eighth and final season of the network’s iconic drama series Dexter, SHOWTIME has teamed up with Coolhaus to create a custom ice cream sandwich called the “KILLER COMBO,” available at all Coolhaus retail outlets and trucks this month. In addition, SHOWTIME has created custom For Your Consideration Emmy Award wrappers used on these scooped-to-order ice cream sandwiches, and will distribute them for free to both Television Academy voters and consumers alike through Coolhaus trucks in Los Angeles and New York this week. One special Los Angeles giveaway location will feature a “surprise” guest appearance from a Dexter cast member. The For Your Consideration Emmy “KILLER COMBO” giveaways will take place in New York and Los Angeles from Wednesday, June 19 through Sunday, June 23, hitting key areas of both cities. In Los Angeles, the Coolhaus trucks will make stops around Studio City, The Grove, Culver City, Venice Beach, LACMA, FIDM and Hollywood, to name a few. In New York, the trucks will stop in Midtown Manhattan, Tribeca, Soho and the West Village. @CoolhausLA and @CoolhausNY will be tweeting daily updates with exact locations and times for where the trucks with free ice cream sandwiches will be parked this week. The bi-coastal promotion of the “KILLER COMBO” ice cream sandwich will feature one dark-side-of-Dexter with a Double Chocolate cookie, one lighter-side-of- Dexter with a Snickerdoodle cookie and a Tahitian Vanilla Bean ice cream with a “Bloody” Cherry Swirl. The sandwich will also be available for sale at all Coolhaus retail outlets beginning in June, including 10 trucks nationally (in LA, Austin, Dallas and New York City), and two storefronts in LA, along with the online store (eatcoolhaus.com/store via SHO.com). The sandwich is also being distributed nationally at various grocery stores throughout the country. DEXTER stars Michael C. Hall in his Golden Globe® Award-winning role as Dexter Morgan, a complicated and conflicted blood-spatter expert for the Miami police department. The series stars star Jennifer Carpenter, Desmond Harrington, C.S. Lee, Aimee Garcia, David Zayas, Geoff Pierson and James Remar. Produced by SHOWTIME, DEXTER is executive produced by John Goldwyn, Sara Colleton, Scott Buck, Manny Coto, Tim Schlattmann, Wendy West, Jace Richdale and Michael C. Hall.